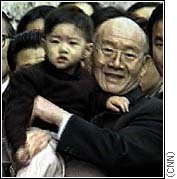 SEOUL, South Korea (CNN) -- After more than two years in jail, two South Korean ex-presidents walked free Monday, granted amnesty by a man their martial law government sentenced to death 17 years ago. Chun Doo-hwan and Roh Tae-woo were serving lengthy sentences for mutiny, treason and corruption. Their release from separate prisons just outside Seoul came out of a presidential pardon proposed by President-elect Kim Dae-jung and approved by current president Kim Young-sam. As they departed, they walked into a throng of reporters and supporters, as well as some who opposed their release. A small group of protesters outside the gates of Chun's prison were angry at the release of people they called murderers. Later, the anger resulted in clashes. At a university near the homes of the two ex-presidents in western Seoul, 300 students clashed with riot police, shouting, "no freedom to Chun and Roh!" Police, holding plastic shields interlocked in front of them and occasionally firing tear gas, blocked students from marching into the streets. There were no immediate reports of injuries or arrests. Chun and Roh, then army generals, seized power in a 1979 coup and arrested then-opposition leader Kim Dae-jung, falsely accusing him of fomenting a civil uprising in the southern city of Kwangju. A military tribunal sentenced him to death, a term eventually commuted to 20 years after the U.S. government intervened. The two ex-presidents had initially been arrested on corruption charges. Mutiny and treason charges were added for the 1979 coup and the crackdown in the "Kwangju Massacre" the following year, in which some 200 civilians were killed. A Seoul district court sentenced Chun to death, and Roh to 22 1/2 years in prison. The sentences were later reduced by the Supreme Court to life imprisonment for Chun and 17 years for Roh. But Kim Dae-jung, now the president-elect of South Korea, appealed for the ex-presidents' release. Both he and Kim Young-sam agreed that the gesture would help reconcile a country torn by the recent elections and enable it to focus on repairing its shattered economy. The amnesty also restored the civil rights of the two ex-presidents but did not relieve them of hefty multimillion-dollar fines. In statements outside the prisons, both Chun and Roh apologized, and expressed worries about the nation's economic problems. "I don't understand how so quickly our economy became worse," Chun told reporters, promising to "do what I can to support the new president, Kim Dae-jung, in reviving the economy." Kim Dae-jung will need all the help he can get. While the two former presidents were being released, the president-elect met with U.S. treasury officials to talk about a $57 billion dollar loan package from the International Monetary Fund. South Korea's sagging economy, hit hard by the current Asia-wide financial crisis, may depend on the aid to recover. Whether everyone agrees or not, with the release of those who persecuted him, Kim Dae-jung is living up to his campaign promise of trying to unite all sectors of society, something many consider crucial if he is to lead South Korea out of its current economic troubles. 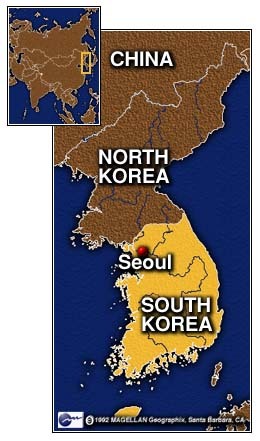 Seoul Bureau Chief Sohn Jie-Ae and Reuters contributed to this report.